Our aluminium pouches are structured to provide a high moisture and gas barrier and are available in a wide range of sizes and pouch types, including stand up pouches. If you can’t find the pouch you are looking for at the bottom of this page or have any questions please contact us for more information. Our high barrier pouches are made from a laminated aluminium, PET, PP and PE, and provide an extra protective layer to your flexible packaging and help keep your products fresher for longer. According to researchers, by 2020 aluminium pouches will be among the most commonly used form of packaging, largely due to the ability of the protective layering to withstand high autoclaving temperatures which make them an ideal plastic packaging choice for food and pet food manufacturers. What are the uses for aluminium pouches? Aluminium pouches, thanks to their high barrier qualities, are a particularly popular choice for laboratories and medical companies who want to make sure their medical samples and devices are safely transported. This type of foil packaging is suitable for an array of pharmaceutical products such as wound care, blood sample bottles, petri dishes and medical accessories such as catheter and other tubing sets. Foil pouches are also widely used in the packaging of health food, the demand for which has increased dramatically in recent years. Thanks to their waterproof and contamination-proof properties, aluminium pouches are ideal as protein powder packaging, wheatgrass powder packaging, or cocoa powder packaging. Similarly, a variety of beauty products – such as face masks and creams – are also the perfect candidates for high barrier aluminium pouch packaging. Another popular application for foil packaging is alcoholic drinks and juices. Drinks manufacturers often choose to package their products in aluminium pouches because they are both economical and provide an extra protective layer for the contents. What are the benefits of an aluminium pouch? Aluminium pouches, also known as foil packaging, are emerging as the packaging of choice across a variety of industries, and this trend is likely to continue. What makes aluminium packaging so popular is the extended shelf life it gives to products. In addition to their high barrier properties which prevent your products from risk of contamination of harmful bacteria and protect them against oxygen, moisture, UV light and odours, aluminium pouches are also customisable with an array of practical features such as resealable ziplocks and sliders, spouts, screw tops and punched handles. Foil packaging is easy to carry and transport, and it allows for hassle-free opening and reclosing for repeated use thanks to its grip seal closure. 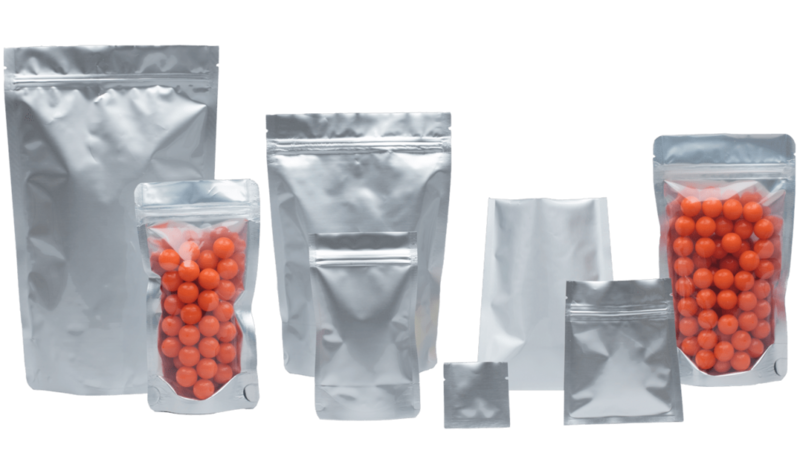 What’s more, aluminium pouches also feature a large printable area on which you can clearly label your products with a list of ingredients, dosage, warning label, recommended serving size, expiration date, potency information, among other essential information. Another great way to utilise aluminium pouches is by custom printing them with a high-quality design – this way you can ensure that the products you are selling – whether medical, food or health supplements – will get noticed in a busy retail environment and convey the desired attributes such as quality, trust and reliability.